This is a powerful and courageous story! 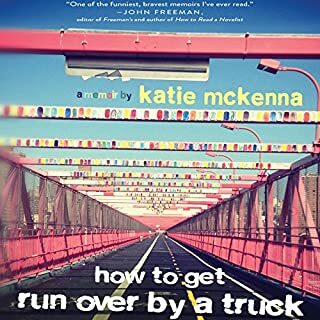 Katie McKenna's "How to Get Run Over by a Truck" is a beautifully written memoir in which she tells of her tragic accident, her survival, and her journey to a life of gratitude for her new normal. Beautifully written and narrated, this is a story for anyone who has forgotten what a gift each and every sunrise is, Thank you Katie for sharing your story with us. You will touch many lives and likely save a few, as well. Amazing book! Applies to screenwriting as well! K.M. Weiland's book "Structuring Your Novel" surprised me. I've read many exceptional writing books--"Structuring Your Novel" is now in my top ten favorites! 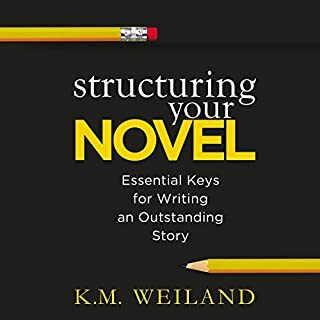 I'm so impressed that I've just purchased K M Weiland's "Outlining Your Novel" and subscribed to her blog, as well. While I was writing, I gained insight resolving a dilemma regarding a key scene in a screenplay that I'm writing. As such, I set aside the recording to write--and the result brought me to tears. Sonja Field's soothing narration matches the tone of the book--polished, professional, and masterful! What an exceptional team! Well done Ms. Weiland and Ms. Field! Thank you! I'm inspired! TWO THUMBS WAY UP! LISTENED TWICE! AMAZING TALE! ADDICTIVE SERIES! 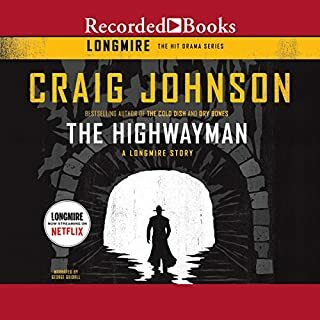 This is another great book in the Walt Longmire Mystery Series, and at 3 hours, 44 minutes, "The Highwayman," offers a novella-length introduction to the series, without spoilers. ("The Cold Dish" is book 1 in the series). I particularly enjoy and appreciate the books in the series which touch Native American spirituality and traditions. I am not an authority on Native American spirituality, nor am I of Native American heritage, however, Craig Johnson seems to address Native American beliefs, spirituality, and customs in a respectfully. George Guidall's narration is masterful! His slow and patient manner reminds me of a loving grandfather sharing tales of his own adventures and misadventures with his children and grandchildren. However, this is a series for adults and older teens--not children. Some of the books in the series contain strong language, but I didn't notice any here. "REVENGE IS A DISH BEST SERVED COLD...."
WELCOME TO THE WALT LONGMIRE MYSTERY SERIES AND ABSAROKA COUNTY, WYOMING! Author Craig Johnson introduces Sheriff Walt Longmire, a man of honesty, integrity, and human frailty. Many readers, myself included, find in Walt Longmire a gentle hero whose commitment to justice and determination to protect others is offset by his own personal challenges. Walt's keen insight is revealed through his quick wit and and camouflaged by his patient manner. 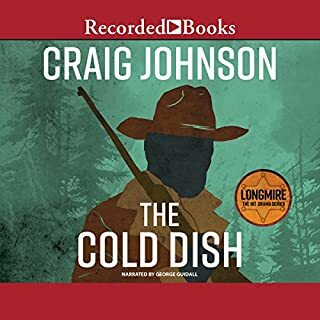 If you're looking for a new series that will draw you into to a captivating world with engaging and satisfying stories which will whet your thirst for more, I'm honored to recommend THE COLD DISH, Book 1, in the Walt Longmire Mystery Series. I'm now listening to the series for the second time, and am finding it even more engaging this time around. The masterful narration by George Guidall is a perfect match for the first person storytelling by Walt's character. Welcome to the world of Sheriff Walt Longmire, his best friend Henry Standing Bear, his daughter Cady Longmire, and his Under-Sheriff Victoria Moretti. And, if you're new to this series, I envy you the journey that awaits. Gives us permission to "Write OUR OWN truth!" I'm new to Anne Lamott's writing and, yes, I'm a fan! I recently purchased "Bird by Bird" and now "Word by Word." I'm impressed with Anne Lamott's simple, yet masterful, writing and the way she paints her world with words. 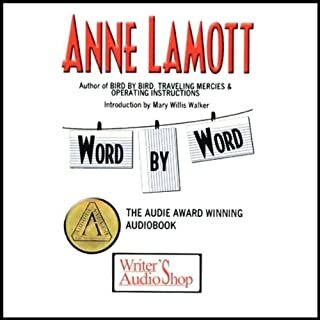 This is a recorded talk that Lamott gave at a writing workshop after publishing "Bird by Bird." For me it's worthwhile because, while, yes, it covers much of the same material that she covers in "Bird by Bird" it distills her writing advice while introducing us to her life and family. She also answers pertinent questions asked by attendees on writing topics such as how to write about family members without causing undue pain, when to quit reworking a bit of writing, and how discover details needed to make a setting come to life. If I were to give Lamott a Native American-type name based on "Word by Word," if would be "Speaks Her Truth"--something that Lamott gives each of us permission to do, as well. I recommend "Word by Word" for those who are writers, those who aspire to write, and those who are tired of remaining silent and choose to live an authentic and "truth based" life--a truth based on one's own beliefs, memories, experiences, and intuition. Try "Word by Word" if you like, then "Bird by Bird" for more depth--or vice versa. As for me, I'm glad to have both in my library. Made me want to hear "The Tournament"! 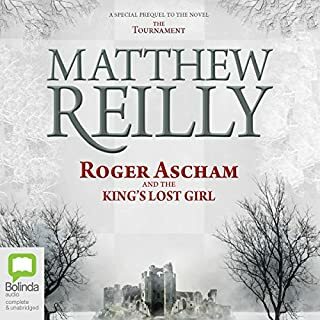 I'm new to Matthew Reilly's books, and found this to be a juicier morsel than anticipated--much like an hors-d'oeuvre that looks to be of interest, and proves to be delicious. As an avid fan of historical fiction, I'm fascinated by Reilly's depiction of King Henry VIII--as a brash and irreverent monarch AND doting father, and of his daughter, a young "Princess" Elizabeth--yes, fellow history buffs--THAT Princess Elizabeth. And having had the good fortune to have visited the Tower of London (reportedly haunted by the ghost of Ann Boleyn) and other sites of England's rich history, I'm even more intrigued at what Mr Reilly has in store for us in future books. Admittedly, there are a few more "He said's" and "She said's" than necessary, and the mystery seemed a bit shy of what Sherlock Holmes fans might expect, however, this story has, for me, done exactly what the author intended--it's whetted my appetite and made me want to hear more, and for that I congratulate you Mr. Reilly. I look forward to hearing "The Tournament"! And to Mr Humphrey Bower--my compliments, Sir, on a flawless narration! You made "The King's Lost Girl" come to life! And a request for you, Mr. Reilly, tell us more about Isabella, and REALLY introduce us to the king's lost girl....you've shown us her beauty from a distance, but WHO is she? Red Stevens has died, and the older members of his family receive their millions with greedy anticipation. But a different fate awaits young Jason, whom Stevens, his great-uncle, believes may be the last vestige of hope in the family. Jason does not become an instant millionaire. What Stevens does give Jason leads to The Ultimate Gift. Young and old will take this timeless tale to heart. A Delightful Story Well Told! 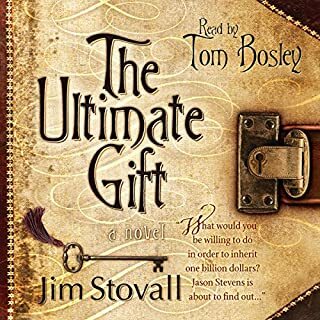 The first of Jim Stovall's "Ultimate..." trilogy and a delightful introduction to his positive oriented books. As an avid self-help enthusiast, I hadn't expected much new info, and yet a number of the key topics (no spoilers, here) were presented with a fresh approach. I look forward to "reading" Jim Stovall's other books. The narration by Tom Bosley was excellent and reminiscent of his role as a kind-hearted father on the TV-series "Happy Days." I don't know whether this audiobook has a printed equivalent, but this very brief (36 minute) audiobook is well worthwhile for RMS Titanic buffs and for classroom use. It tells the story in what are reportedly the recorded voices of various survivors including 2nd Officer Charles Herbert Lightoller, the highest ranking officer to survive the sinking of the RMS Titanic. I purchased this to supplement a thematic unit on the RMS Titanic with my 4th Grade elementary school class. It kept my students' attention from start to finish. Since it's so concise, I wouldn't use this as the very first account of the disaster, but it's a great followup. The music adds to the mood but makes the introduction a bit hard to hear. After that it balances out. For those wanting a more thorough account of the RMS Titanic disaster, I'd recommend Walter Lord's "A Night to Remember" (unabridged) as well as "The Titanic: Disaster of the Century" by Wyn Craig Wade. Also, for historical fiction, George Korman's "Titanic Trilogy" is excellent for classroom use for 4th grade through 9th grade. (It's written at approximately a 6th grade reading level but is high-interest). 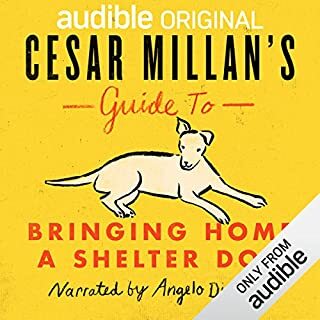 I'm using it for Guided Reading for three groups in my classroom using the print version (available through Scholastic or Amazon) along with the unabridged audio from Audible.com. 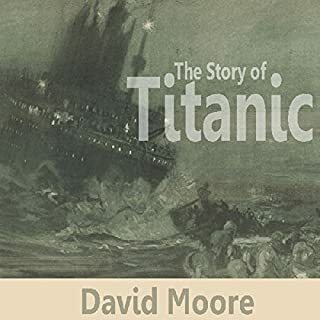 Since the Audible.com member price for "The Titanic Story" by David Moore is less than $4.00, as of 04-15-2012, I'd recommend buying the book as an additional purchase and not using a membership credit to purchase it. Simply uncheck the "credit box" on checkout and then select "update." It's also available on Amazon.com as an mp3 download. This version leaves too much out! Go unabridged! I thoroughly enjoyed the unabridged version of "Outlander," the first book in the series, and was disappointed that the unabridged version of "Dragonfly in Amber" wasn't available. Finally, I purchased and downloaded this abridged version. The very next month, the unabridged version came out! As such, I've had the opportunity to listen to both. I highly recommend the Outlander series. Diana Gibaldon's storytelling ability is amazing! She takes the reader/listener on a rare and enchanting journey. Here's the catch--the abridged version (edited from 38+ to 6+ hours) leaves WAY too much out! As I listened to the abridged version, it seemed to just zip by. I didn't connect with it as I had with the full version of "Outlander." But, when I downloaded and listened to the unabridged version of "Dragonfly in Amber," the magic returned! This story is well written and narrated, but too much is lost in the abridged version. It's been overedited, leaving little more than a skeleton of the full story. The unabridged version may seem daunting at 38+ hours, but it's a delightful journey and, for me at least, well worth the time. Please enjoy the story as the author intended--unabridged and at your leisure.